Who knew it would be so easy? This is more of a Kitchen Hack than it is a Recipe. Snip the top off the bulb of garlic. Coat the bulb with Olive Oil. Wrap the bulb with Aluminum Foil, adding extra Olive Oil before closing the wrap. Cook for 30 minutes at 400F or until tender. Now, you know my recipes, there are always back stories and reasons why I do things. I tried this because it sounded tasty. That's the simple summary of it all. Roasted Garlic, done this way, will spread like butter, if a little chunky. The flavor becomes sweet and not so harsh. You get the Garlic flavor that your recipes call for but it isn't quite so "violent". The added sweetness will be welcome when you add it to a Pizza Sauce, since most of the best ones really require that. Add some to a jarred sauce and tell everyone you made it from scratch. Yeah. That's it. I made it from 'scratch'. No you can't hear the quotes. I won't tell. But seriously that's it. The garlic was a "throw in" item when I made the chicken pot pie recipe a while back. Just prepped it and tossed it in on a corner of the cookie sheet. Ok, ok, I'll stop with that, but really even non cooks can do this one. I wasn't kidding about the pizza sauce either. 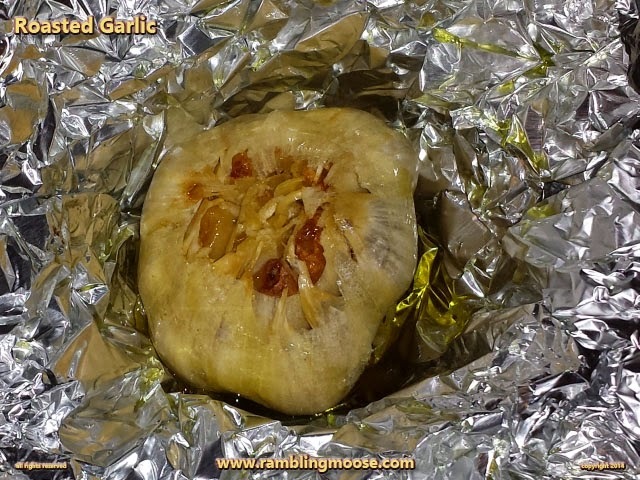 I took about a half of the bulb since roasted garlic is more mild than regular garlic, and "smooshed" it into a paste. Adding the paste to the sauce, I then made a pizza which was noticeably better than the last time I used the same sauce. If you are doubting me, you can find a pound of garlic in the warehouse stores for about three bucks. Try one and if you hate it forget that I suggested it. But you really don't need that expensive one purpose gadget, just some aluminium foil.